Superman explains recent events to Batman and Wonder Woman and how he has become aware that some outside force has been manipulating him and his family. The burden of this information has begun to torment Clark in his dreams as he tries to make sense of his new merged existence. His suspicions and self doubt have begun to manifest themselves in his dreams and with such power and influence Clark fears what might happen if Mr Oz continues to manipulate existence. Considering all the information, the dreams and the dark possibilities Mr Oz represents Bruce advises them to keep this information secret from the rest of the League, the risk of keeping such a big secret threatens to tear them all apart but if they don't it could become even worse. As they agree to their promise Mr Oz watches from afar. Story - 4: This issue has dealt with more than Action Comics as Bruce and Diana force Clark to open up but there are still mysteries unresolved but I guess it is still a waiting game. Rather than 'fuzzy' 'fading' 'blurry' as descriptions of what happened to Clark, Bunn deals with Reborn's ramifications head on. Dreams are often a route to manifest psychological trauma so it makes perfect sense that some of Reborn's aftermath would come out this way. With Diana also suffering from exposed lies and a confusing new truth to her life it made perfect sense that they would have common ground. The solution Bruce presents is more a soap opera trope than a logical step the Batman would usually present as the house of cards is now set up to destroy the Trinity and the League when it eventually comes to light. A disappointment with this issue is that I wanted so much to see what would happen with the New Pandoras... oh well, it was still nice to see the Trinity bond on a dramatic level rather than in battle. Art - 4: Lupacchino's art presents a different dynamic to the Trinity and in the bright setting of the Fortress they are in full well lit focus. Of all three of the Trinity, Diana steals the show with some stunning line work, though they each look noticeably youthful. A nitpick which is minor to some is the coloring of both Supermen's suits (not the multiverse scene) New 52's suit is much darker and of note, metallic in texture whereas both Rebirth and Reborn Supermen's suits have gotten progressively lighter as they moved closer and closer to a more optimistic palette. This issue the coloring made them all look the same so you had to study Lupacchino's art to weed out the differences. Minor as I said but not something I could ignore. Cover Art - 5: Holy Moly what a cover! That is some exemplary pencil, ink and color work right there. Mr Oz looks positively menacing and overconfident I really want to see Superman, Wonder Woman and Batman wipe that smirk off his face. 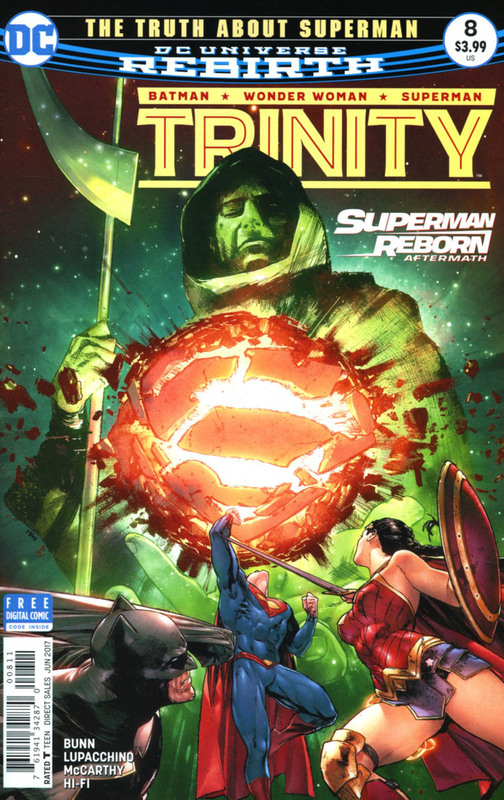 Trinity continues to have some of the most stunning covers. Variant Cover Art - 5: Unlike the direct cover, despite this showing a scene that happens inside it doesn't have the punch the other does. 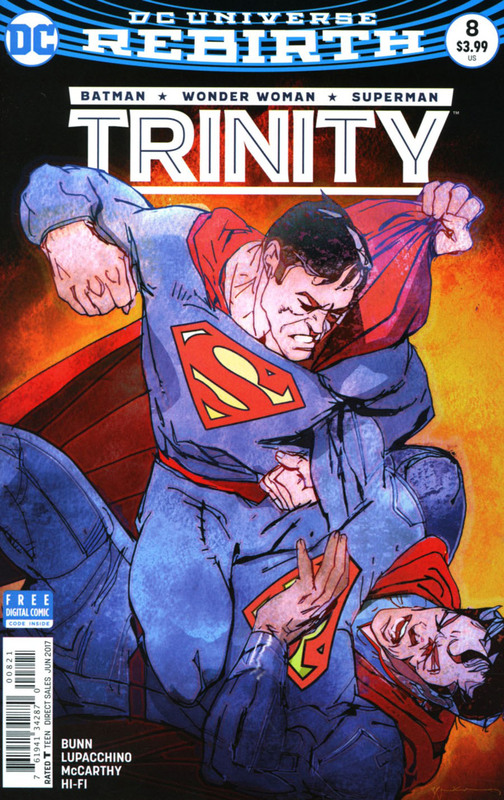 It is always cool to see Supermen fight each other (ever since I saw Superman III as a kid) I've always loved every rendition of the duel and this is no different. The color palette again makes identification difficult but it is still awesome regardless!